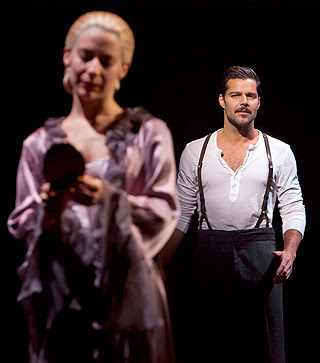 Ricky Martin plays the role of Che and Elena Roger that of Eva Peron in the latest version of 'Evita', which is returning to the Broadway stage after 3 decades. The original production of the show earned the show's creators Andrew Lloyd Webber and Tim Rice seven Tony Awards in 1980. British director Michael Grandage said the task of revamping the work of the original director, Harold Prince is daunting, but exciting. "When there has been a very iconic first production as there has been with 'Evita' and Hal Prince cast a very long shadow and that is nerve wracking," the Telegraph quoted him as saying. "Somebody at some point has to come along and do something different. I'm very happy to have been invited and happy to stand up with this production and say here's 'Evita' again after 30 years. It's been lovely," he said. The story of 'Evita', a former actress turned First Lady, adored by many Argentines for helping women get the vote, securing labour benefits for the working classes and founding hospitals and orphanages, was turned in a West End musical by Tim Rice and Andrew Lloyd Webber. The charismatic first lady, second wife of Argentina's late President Juan Peron, died in July 1952 at the age of 33 at the height of her popularity and after months of illness. The musical generated hit songs with 'Don't Cry for Me Argentina' and 'Another Suitcase in Another Hall' went on to be made into a film in 1996, with Madonna starring in the lead role. 'Evita' will be playing at The Marquis Theatre in New York City.